Many tours include a visit to Japan in the Kansai region , which since ancient times is the main trading center of the country. Thanks to an active trade for centuries Kansai acquired its own character – a dynamic, full of energy region where tourists are concentrated a lot of interesting. The largest city in the region is Osaka from Tokyo it is separated three o’clock trip to the “Shinkansen”. Osaka is the third city in the country by population, is a major industrial and transport center. 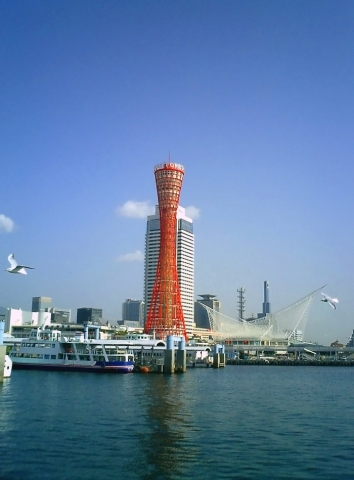 Osaka is located around the mouth of the Edo river and the whole city is permeated with a network of water channels, which is a determining factor for the development of the city for centuries. Osaka is the center of the city of entertainment and attracts large number of tourists. 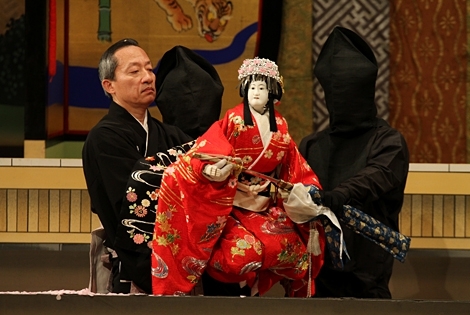 It was here that was revived the ancient Japanese theater Bunraku , its amazing puppetry can be seen today, visiting the city. 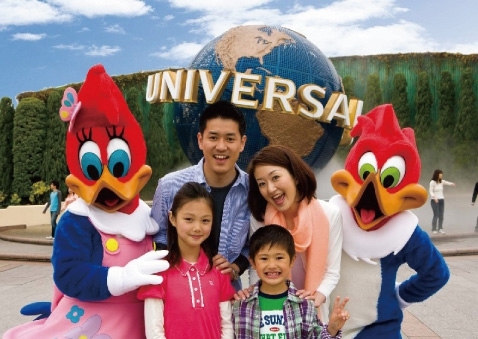 Start of the 21st century was marked by the opening of Osaka park of Universal Studios is Japan , which is a bit of Hollywood in Japan. This park is very interesting for visitors, and tourists are sure to inscribe it in their itineraries. 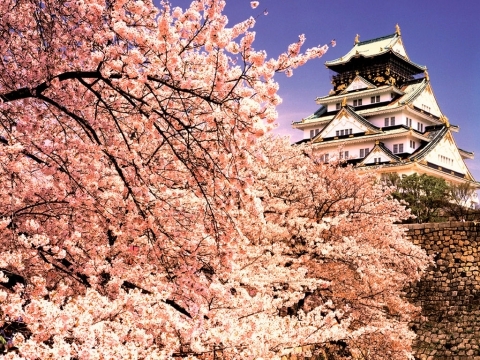 The most important landmark is the ancient Osaka Castle , built in the late 16th century. The founder of the castle is Toyotomi Hideyoshi, and in the main tower of the castle kept Toyotomi family documents and works of art associated with a family history of the entire city. 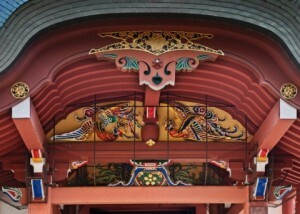 Nakanoshima Village, which is located in a cozy Delta Edo River, famous for the majestic temple Temmangu . The temple was built in dedication Suguvara Michizane, a famous scholar and statesman of Japan, left a lot of scientific papers. Adjacent to the temple passes Tendzinbasi Street, where you will find plenty of shopping pavilions. Walking around the temple, you can meet monks, see the ease and simplicity of lifestyle Nakanoshima population. All fans of urban entertainment and exciting shopping is recommended to visit the area of Umeda , located around the main train station in Osaka. 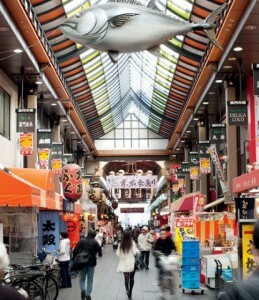 Umeda is a complex of underground streets that are constantly filled with tourists. There are many fashionable shops, offering a variety of products. Osaka is famous for its restaurants and cafes, food here is so good that there is a perception that it is impossible to visit Osaka, without spending all their savings on food. The most famous delicacies are Osaka yaki-niku – pieces of meat roasted on a grill, a fig-nabe – specially cooked fish in pots Fogo, as well as a variety of meat, vegetable, mushroom mini-kebabs. 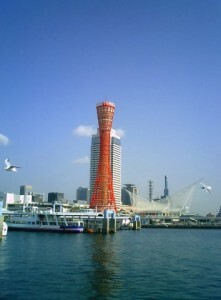 In half an hour from Osaka is a major sea port of Kobe . The city began to rapidly grow and develop in the second half of the 19th century, along with the Meiji Restoration. Kobe is surrounded by high hills, among which rises the mountain peak Rocco. The city attracts thousands of tourists as much as Yokohama, as here there is developed infrastructure recreation and entertainment. In the evening is worth a stroll in the harbor and look at the port tower that rises above the city (its height is 108 meters). Best vacation club can be found in the Port Island – an artificial island, literally teeming with entertainment. Night view of the city is beautiful, and Port Island is always a lot to entertain the tourists. 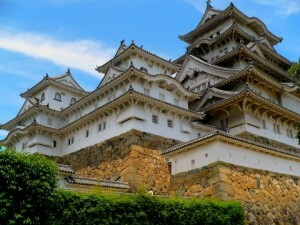 One of the highlights of the western part of the country is an ancient castle of Himeji . He is considered the most beautiful buildings of Japanese architecture. The castle is built in such a way that the side resembles a white bird, hovering in the air. This attraction is declared a national treasure of Japan and is inscribed in UNESCO’s list of protected cultural heritage of the country, along with the pilgrimage along the Kii mountain range located in Wakayama region . One of the most interesting objects for thousands of tourists is a mountain monastery Koya , which can be reached from Osaka by train for two hours. The monastery has a long history, it was founded in the early 9th century and belongs to the Shingon Buddhist sect. The complex of buildings that make up the monastery consists of 120 small temples, many of which offer tourists a rented room with a modest vegetarian cuisine. During the year, the monastery is visited by about a million people – tourists and pilgrims. Thanks to recently discovered route connects the main island of the country – Honshu, Shikoku with the region, anyone can enjoy views of great beauty by going on a tour of the seven bridges .The Inland Sea, formed islands of the Japanese archipelago, gives a rich landscape and gentle climate. According to the Inland Sea has always been a lot of ships, and in conjunction with a few green islands amid the blue waters of this creates a wonderfully beautiful picture. Continue on the Seven Bridges, which are a set of bridges across the inland sea, within easy driving from one bank to the other, is required. Such beautiful species you will not see in any other part of the world – a small village with fishing boats, salt fields, tiny port on the background of the endless sky and the water. New Marine Simane path through all seven bridges and is sixty kilometers. The richest impressions of this route can be obtained, if you prefer not to a car and a bike ride or hike. By sea, you can sail on a cruise ship is traveling more fun than a car trip with seven bridges.Passenger ships offer tours with stops at major ports, such as Osaka, Kobe, Wakayama. The islands are located in the inner sea, are of particular interest. 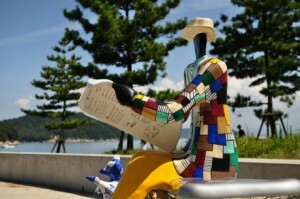 The island of Naoshima is famous for the eponymous village, which is an art museum located in the open air. Architectural creations side by side here with the works of the masters of modern art, and all this is surrounded by magnificent scenery. 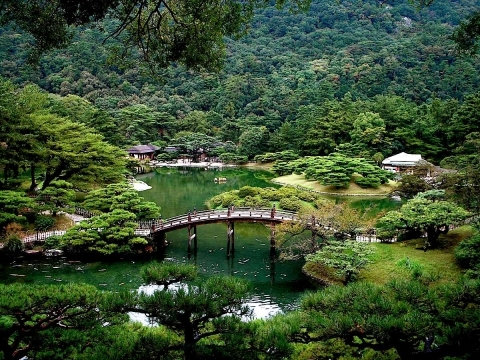 Shikoku Island is just four prefectures, each of which is interesting and worthy of attention. 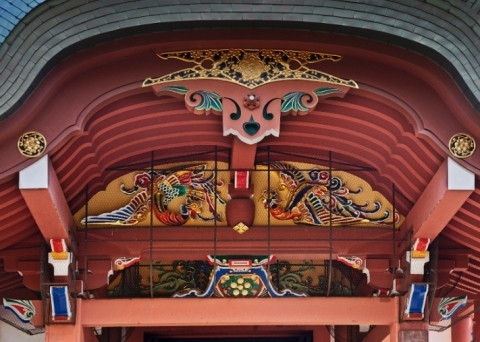 All prefectural formed around cities – castles, and each of them has its attractions. City of Takamatsu , which is a major port, is often called the gateway to the island by sea. It is from here originate the main sightseeing tours around the island of Shikoku. Takamatsu is rich in beautiful landscapes, here is one of the best parks in Japan, made ​​in the traditional style – Ritsurin Park. From Takamatsu should go to the largest of the cities of the island – Matsuyama . The ride on the express train takes three hours on maritime transport – a little more than an hour. Matsuyama Castle miraculously survived to this day and is a masterpiece of ancient Japanese architecture.Not far from the city of Matsuyama Dogo Spa is known, appeared in the country one of the first. 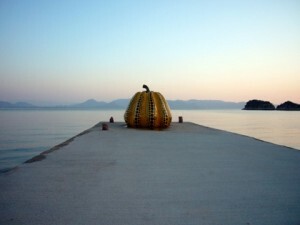 At the same distance from Takamatsu is a third of the island prefecture – Kochi . Most of the Kochi area is reserved for agricultural work, is a thriving fishing and farming. On the southwest coast of the island, relating to Kochi Prefecture, is a national park, where the traveler can get a lot of entertainment – from diving to study whale life. Last prefecture – Tokushima – attracts tourists mainly in the summer, as there is held the famous Dance Festival Awa Odori . The forty-minute drive from the city of Tokushima is Naruto Strait, where you can see the huge whirlpool, striking the imagination. To see the maelstrom as close as you need to go to sea tour of the Naruto Strait.